Our last of countless overnight bus trips in India was among our more eventful journeys. During this trip we had a mother and two small children sitting behind us, with the husband seated across the aisle. This man was particularly protective of his family and was determined that they receive every comfort possible. For one, he demanded that Andrew and I would not recline our chairs. After a heated exchange, we held our ground and maintained a semi-recline so that we could get some sleep. Furthermore, our seats were in the unfortunate position where the windows in front and behind us met, so we were shielded from any breeze. As such, I thought it was only fair that the little ceiling fan be pointed on us. But, as soon as I would fall asleep, the father would reach over my head and move the fan back on his wife and children. This went on for hours, until eventually I fell into a sweaty sleep, having conceded the fight over the fan. 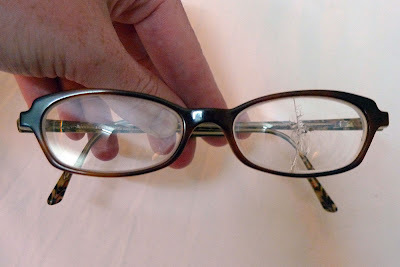 When I woke up in the morning I noticed that my glasses had fallen onto the floor, right by the feet of the protective father, and the left lens was completely cracked. Whether he stepped on my glasses on purpose or by accident I will never know, but regardless he had ultimately reigned triumphant in ruining my 16 hour journey. 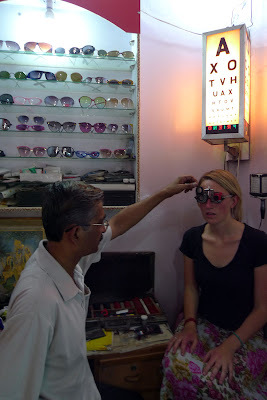 Upon our arrival in Delhi I rushed off to get a new pair of glasses made. We visited our favourite vintage sunglasses salesman who happens to run a little optometrist clinic in the back of his store. 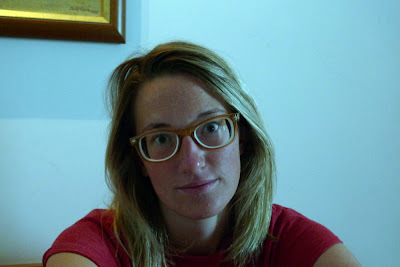 My eye exam was pretty hack, but the promise of new glasses within 24 hours was too good to pass up. The resulting specs aren't perfect. The lenses are about half an inch thick, and I see double for the first five minutes of wearing them. But, I can't really complain... they cost me the lesser part of $13. Looking forward to seeing you and avs in a couple of weeks, but I'll miss the updates.